Stubborn Mule aka Sean Carmody has recently had an intriguing set of posts describing a data visualisation technique known as Risk Characterization Theatre, due to Erik Rifkin and Edward Bouwer. As all of the above point out, and reminiscent of behavioural economics, even highly technical professionals are pretty lousy at intuitions of risk, but our performance at this might improve if information is stated in a way that better suits our non-Bayesian brains. A new helmet law reduces bicycle deaths among the affected age group by about 19%. It doesn’t affect older riders. Since serious bicycle accidents are rare, however, the absolute numbers are still small, about eight fewer deaths a year among kids 5 to 15 than would otherwise occur in the states with helmet laws. “It’s not a ton of lives when you compare it to something like wearing your seat belt,” says Prof. Stehr. One reason for the drop is, of course, that more kids wear helmets when they get into accidents. But another is that many give up cycling altogether. Using surveys of parents, the professors find that about 650,000 fewer children ride bikes each year after helmet laws go into effect. That’s about 81,000 fewer riders for every life saved. She goes on to nicely contrast this to more innovative and less regulatory approaches in Europe, and has some more detail on her blog. Thinking about transport and health as an industrial design problem rather than a legal one can flag up other unintended consequences: obesity, asthma, and so on. One “natural experiment” demonstrated this: In Atlanta during the Olympic Games, people drove less, taking public transit to get into the city center. As a result asthma hospitalizations dropped by some 30 percent. Indeed, taking a lead from Free Range Kids and contrasting obesity and diabetes rates with abduction rates might be worthy of another performance at the Risk Characterization Theatre. Back to bikes. 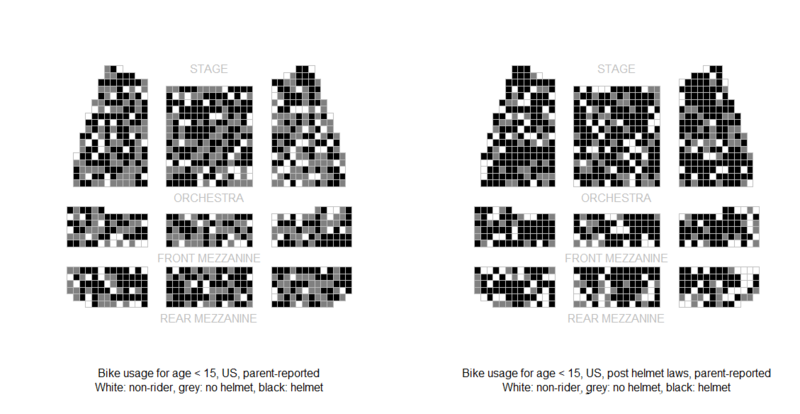 Sourcing figures from a public draft of the paper mentioned above, Intended and Unintended Consequences of Youth Bicycle Helmet Laws (PDF), and making use of Mule’s kindly open sourced R scripts, I threw together the following, using the Always or Almost Always figures. Click through for the more readable large versions. A clever aspect of Carpenter and Stehr’s paper is the use of parental and youth surveys on helmet usage. 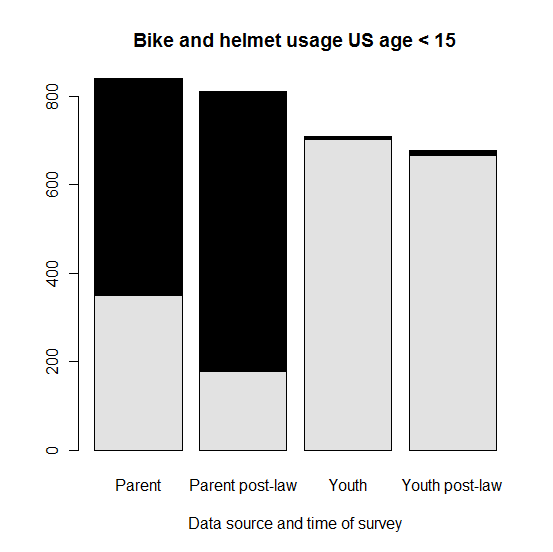 Perhaps unsurprisingly, the youth surveys show much lower helmet takeup rates. Much as it was when I was a Queensland schoolchild and a helmet law was introduced. Style-wise, there has definitely been at least some progress since then. Much as the original post warned then, and with the unread spirit of Tufte floating over my shoulder and screaming in a smugly vindicated fashion, it’s a diagram that has to be used with caution. This little sketch hardly invalidates the technique though. Part of the original discussion was whether any benefit came from conveying extra information through shading, or the extra complexity undermined the explanatory power of the chart. The virtue of shading comes out nicely in conditional probability cases. 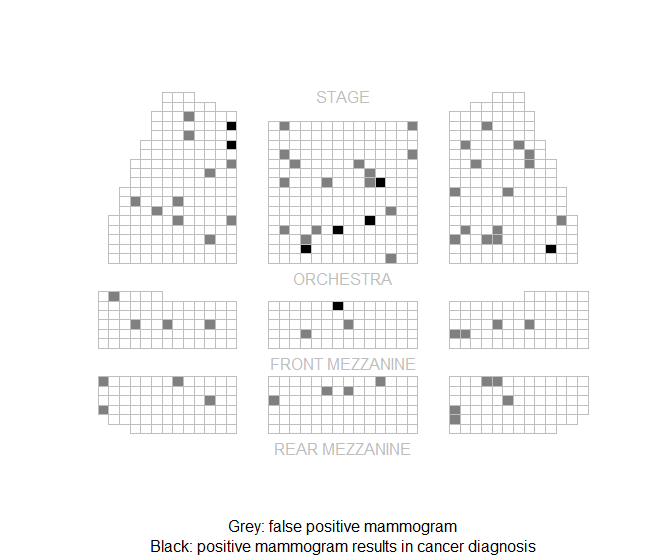 As described again by Mule and based on research by Gigerenzer, the meaning of mammogram positives can be difficult to explain because the brain is lousy at conditional probability, and in this specific case, the false positive rate is a fairly high 7%. 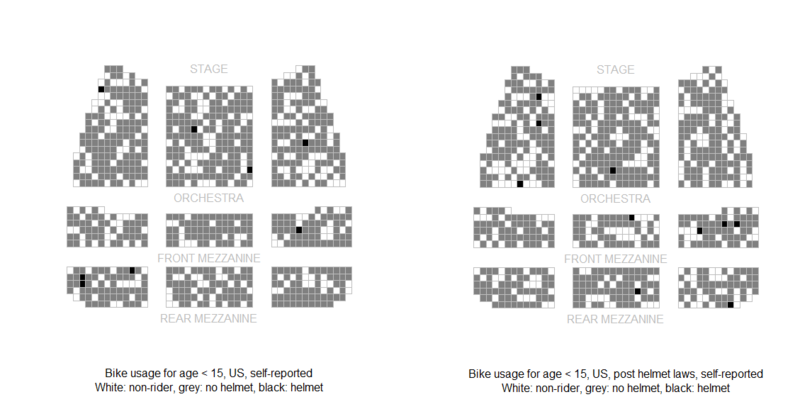 In these cases, the shaded Risk Characterization Theatre seems an elegant way to illustrate related natural frequencies.